For a business, file maintenance is a basic need of storage products. The files may be financial statements, personnel data, classified technical documentation, etc. Archives loss or file corrupted will be possible to make a huge economic loss. In industrial operating environment, storage devices may face high temperature or a big freeze, and perhaps there are shocks to influence the operating of devices. Of course, the common goods can not be used in a harsh workplace. For this kind of needs, KINGMAX launched series of storage products as industrial class. KINGMAX let their products endure the hardest test without any compromise. KINGMAX industrial products not only fit in compliance with design guidelines, but also tally with industrial standard. The strict tests are about environment tests, mechanism tests, electrical tests, etc. For example MIL, JESD, and IEC test. The severe quality control makes KINGMAX products guarantee high-quality and reliability. 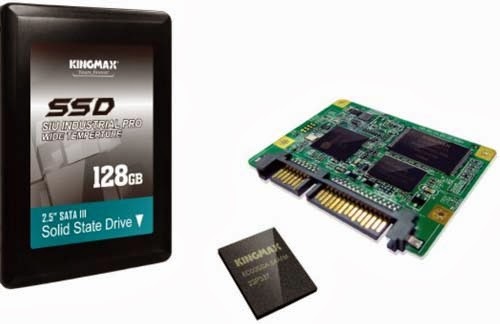 KINGMAX launched full gamut of storage solutions for industrial users. The SSD (Solid State Drive) provides many choices for business. The high-efficiency embedded solutions, like MCP, eMCP, and eMMC, bring fresh perspective for industries. There are more products such as memory card, DRAM, etc. KINGMAX products make good performance in harsh environment with high-tech and high-speed. A market veteran keenly aware of customer needs, KINGMAX is always meticulously exact about different product requirements for different industrial environments. For instance, its products are designed to work in operation temperatures ranging from -55°C to 85°C, depending on the environment or application they are assigned to. For embedded systems, smartphones, tablets, vehicle systems, POS, kiosk and other applications, users can look for suitable components from a variety of KINGMAX storage solutions. In-house packing and testing keep KINGMAX on the leading edge of design and quality control. TinyBGA and PIP are KINGMAX patented packaging technologies that deliver durable Flash products. KINGMAX gets well-reputed because of their best products and good after-sales service.